I spoke to a couple of different antique jewelry dealers while investigation my Salmon & Gluckstein silver banded pipe. They both dated the silver band on the pipe to 1896 and both explained that the hallmark only determines when the band as certified. According to them, the large numbers of the bands would be made for a pipe manufacturer and they would be used for several years until they ran out. The band on my pipe was hallmarked for 1896 for example but the pipe could have been produced anytime between 1896 and 1915 according to one of the antique dealers I spoke with. Lordy, I'm really getting into the faux spigots lately. My IMP with a new gaudy eBay stem. 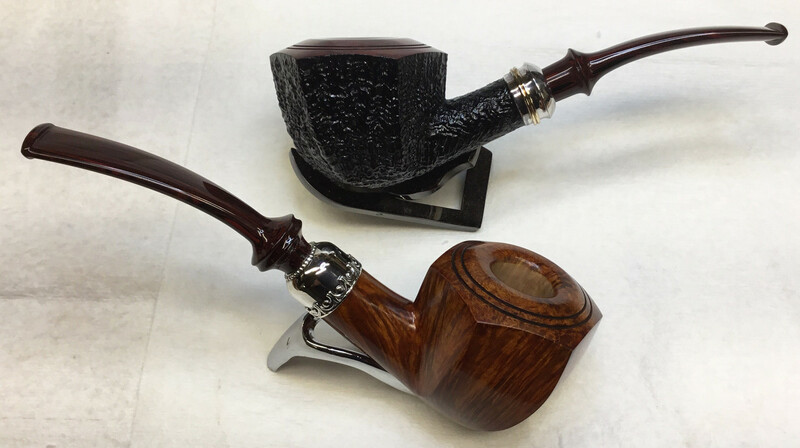 There are some absolutely beautiful pipes in this thread! I like a bit of bling on a pipe, though it isn't a requirement. Still, on an antique piece it can really add elegance. I own only 3 Peterson’s , each with sterling bands and one Spigot calabash. This is more than just bling. I mean, I love bling. Bling for its own sake is great. But this is bling, and then some more work to go past bling. The fine, delicate work on the wind cap is intense. That fence treatment, with individual holes cut under each crenulation as well as over, is really something. That would have been fabulously expensive even in an era when silversmith work was much cheaper than today. Edit: Also, what are the hallmark dates? Is there more than one silversmith's mark on it? Edit2: Also, what is the assay office for the hallmarks? It's hallmarked for 1883 and it's a Barling. I wish I owned it. I just sold on eBay for a little over 2G's. I own one from 1882 that's similar. The best thing about these elaborate windcap pipes is that they're only really practical outdoors. In the late 19th century someone was out there selling outstandingly complex, expensive pipes for walking around. 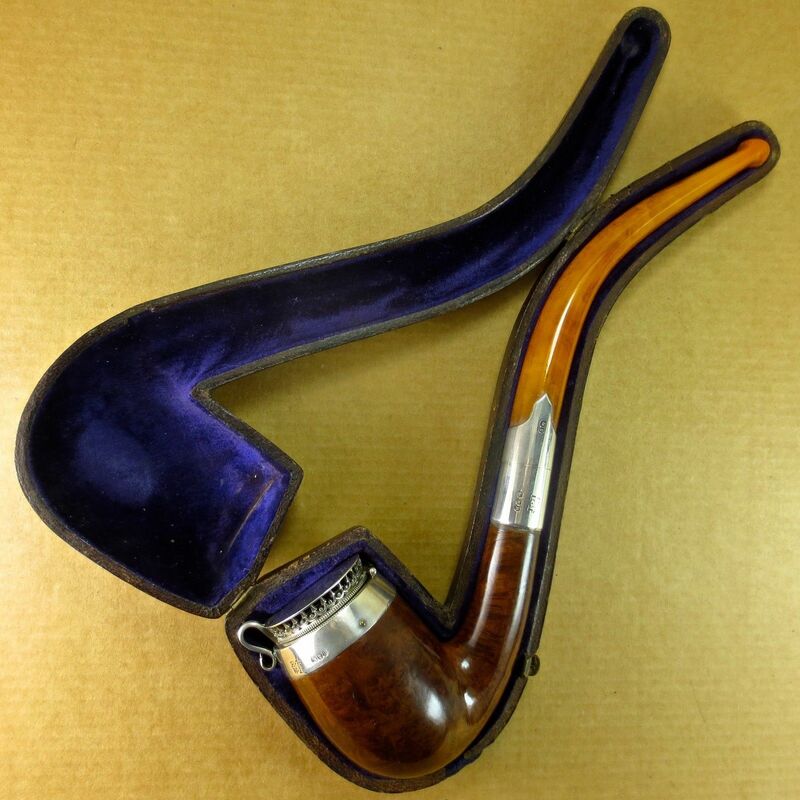 My "fancy" pipes stay indoors, on carpeted surfaces mostly. There were London "gentlemen" walking around with 100 hours of a silversmith's labor dangling out of their mouths! WIndcap pipes look great, but are more of a chore to smoke. With the windcap down a lot of heat can build up in the chamber, which isn't desirable. Since I only smoke outdoors, on those occasions that I smoke one of my windcapped pipes, it's always with the cap flipped up. Kind of defeats the idea, but then so does the windcap. Keep in mind that these ornate windcaps were castings, so the work was in the finishing and polishing. But yeah, definitely a pricey luxurious option for the discriminating affluent person. Almost forgot, the city hallmark is always for London on anything made by Barling. Outdoors, I very frequently use aftermarket windcaps because I live in a windy area. Couldn't get by without'em. Are the old-time windcaps just much more restrictive than the $2 aftermarket models? I don't know if the old windcaps are more restrictive than the modern aftermarket windcaps. I worked for a jeweler for almost a decade, starting when I was in college. The guy I worked for had been apprenticed as a child and learned the craft in the 'teens and 1920's. Watching him work precious metals was an education. I watched him make a waldemar for a client's antique pocket watch. He went from cutting up a small slab of gold to a finished waldemar, with each link adorned with intricate hand engraving, in about two hours. I did a lot of finishing work on castings, as well as taking used gold, melting it down and turning it into gold wire and gold slabs for jewelry making, so I have a good idea how these windcaps were made. BTW, I also learned how to design fabricate a large variety of custom jewelry pieces. Take some of the ash from your pipe and rub it on the silver/nickel. Then rub the ash off with any wipe (t-shirt, towel, napkin, hanky, etc). If you're careful you can even do this WHILE you smoke the pipe . This works on copper too, by the way. I was given this tidbit of advice years ago and have had no ill effects from this method on any of my pipes. 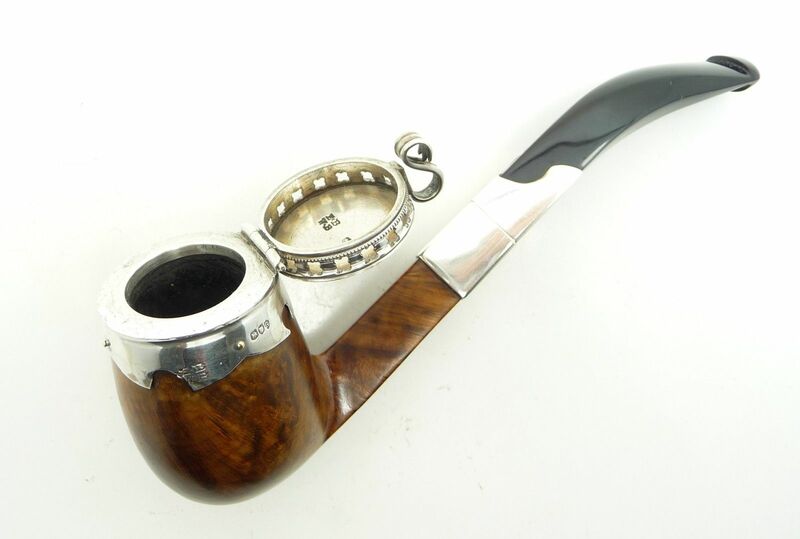 Most of the time, I think silver bands detract from a pipe's appearance, but not much. They're far from a deal breaker. Prefer an understated appearance. But then I have an F-150 that's so good looking it's embarrassing. You can go too far. I think that a well done silver embellishment can really enhanse a pipe. I both cases I, personally, really like the effect. Most Petersons without a band just looks unfinished to me, like something's missing. Well, I sure don't think that's gaudy. It looks mighty handsome.